Running The Fascists Out Of Town! 1) Can you tell us a little bit about where you live? We’re present in the city of Nyköping. It’s your regular city, nothing very special about it! 2) When did you notice that nazis were beginning to be a problem in your town? Was there a certain event or point that made you decide that you had to take action? 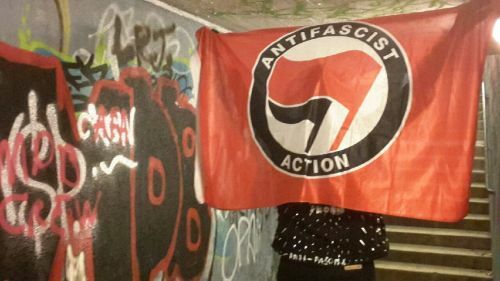 We decided to get together and do something ourselves when we started noticing an increase in fascist activities in our city and everywhere else, and to get this city as friendly and as discriminatory free as possible for the refugees that would be arriving. 4) When you decided to take anti-fascist action in your town, what concerns did you have? Most of our concerns were with safety. Being masked up and dressed in black only gets you so far, and there were certain concerns with security officers and cops. Seeing as these “soldiers of odin” also are masked up, people had a bit of a fright when we started out, until we showed them where we stood whenever we were out. 5) How did you decide what action you should take? Did you research it first, or talk with other people? We did a lot of research before! We actively follow this tumblr and have made use of a lot of the tips. We started out with first covering small areas with just stickers, but quickly moved on to street art, longer nights out and covering larger parts of the city with stickers in one go.